Balloon vine is a herbaceous weak plant, about 3metres long. The leaves are alternate, divided into three parts, each having three leaflets. Those leaflets are elongated, deeply lobed, the centre lobe sticking out the farthest. Small white flowers with a pair of tendrils at the base of the cluster which supports the plant for climbing are seen. The fruit is filled with air, somewhat triangular and ribbed. Inside the fruits are three round black seeds, each with a white spot at the base. The plant grows in thickets, waste and settled areas. Abnormal accumulation of liquid in the cellular tissue. Promotes vomiting, and gives tone to the stomach. Local inflammation of skin and rheumatic joints. The infusion of the stem and leaves is used in diarrhea and dysentery. The leaf may be consumed to cause vomiting. The decoction of roots is also emetic or causing vomiting, laxative, stomach or giving tone to the stomach, emmenagogue or promoting menstrual flow. 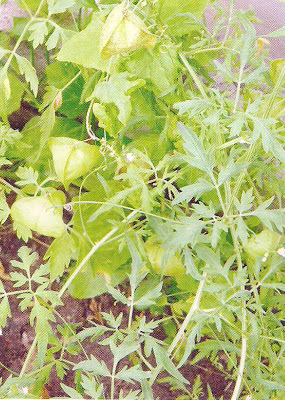 Decoction of roots is also used in gonorrhea, deworming and erysipelas or subcutaneous disease. The leaves coated with castor oil are applied to rheumatic joints, swellings and tumor. A paste of the leaves is used for dressing syphilitic sores. When inhaled, the steam of the decoction of leaves headache. The root, stem and leaves. Normal. For root decoction, a teaspoon at a time should be taken twice a day.